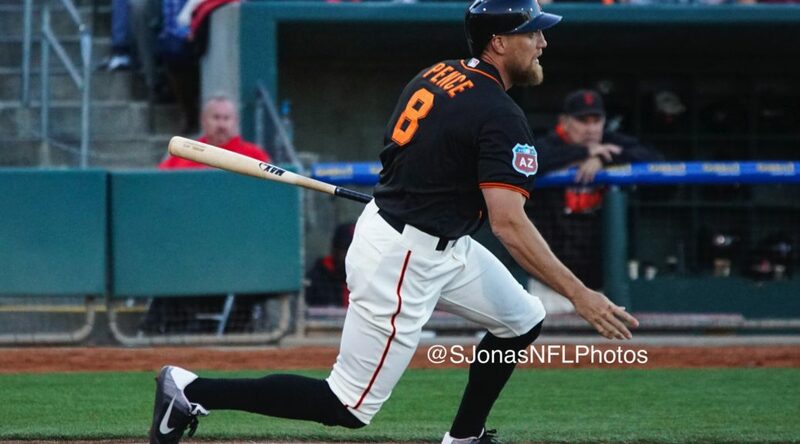 WEST SACRAMENTO, Calif. – Less than 24 hours after the Sacramento River Cats and Reno Aces went down to the wire, Jake Peavy and Gabriel Arias picked right up where the two teams left off in Sunday’s Father’s Day finale. Peavy pitched extremely well through six, but despite the strong start and Duvall’s PCL-leading 15th home run, the River Cats dropped the finale 3-2 to the Aces. In what was likely his last rehab start with the River Cats, Peavy continued to impress on the mound. The veteran right-hander went 6 strong innings, yielding just 1 run on 5 hits and 2 walks while striking out 3. He threw 93 pitches on the afternoon, 61 of them for strikes. Despite not winning a game while with Sacramento, Peavy (0-2, 5.47) continued to improve with every start. His 30-day rehab assignment ends tomorrow, and it remains to be seen what the San Francisco Giants have planned for the former Cy Young winner. Opposite Peavy, Arias (3-1, 4.33) was equally impressive for Reno. The 25-year-old also went 6 innings, allowing 2 runs on 4 hits and 2 walks while striking out 7. Both runs he allowed came on solo home runs. Adam Duvall and Hector Sanchez provided the offense for the River Cats, each hitting a home run in Sunday’s loss. Duvall’s was a sixth-inning shot that put the club ahead 2-1 and gave him 15 home runs on the year. That total puts him alone in first place in the PCL, one ahead of Fresno’s Jon Singleton and Reno’s Peter O’Brien. Sanchez’s was a second-inning line-drive home run into the River Cats’ bullpen which put Sacramento ahead 1-0. Reno took the lead 3-2 for good in the top of the seventh. Trayvon Robinson homered to lead off the inning, tying the game at two. Nick Buss scored a few batters later on a throwing error by Hector Sanchez. The River Cats committed two errors on the afternoon and now have 77 for the season. Ehire Adrianza went hitless, snapping his hit streak at eight, just one shy of tying his season high. During the streak, Adrianza hit .300 (12-for-40) with two doubles, a home run, and six RBIs. The River Cats get the day off tomorrow before traveling to Chukchansi Park on Tuesday for a quick three-game series against the first-place Fresno Grizzlies. Getting things started for Sacramento will be the right-hander Chris Stratton (0-0, 2.08). Although he doesn’t have a win at the Triple-A level, Stratton has been excellent since joining the River Cats, allowing just 5 runs (4 earned) in 17.1 innings. For Fresno, it’ll be the southpaw Luis Cruz (3-2, 4.23). First pitch is set for Tuesday night at 7:05 p.m.
WEST SACRAMENTO, Calif. – Matt Cain and Jhoulys Chacin battled Friday night, engaging in a pitcher’s duel in front of a full house at Raley Field. With over 400 career major league starts between them, the two hurler’s kept things locked in a 1-1 tie until a Blake Lalli RBI-single in the seventh put the Reno Aces up 2-1 for good. Cain (0-2, 4.50) went 6.2 innings in his second River Cats start, throwing 89 pitches, 59 for strikes. He gave up 2 runs on 5 hits and no walks while striking out 6. It looked like the Aces were going to strike early, but Cain pitched around a first inning error by Hector Sanchez and stranded Reno’s Nick Buss at third base. He retired the next eight before the Aces came through with a run in the fourth, tying the game at one. Cain held Reno at one until the seventh, when Lalli singled home Cody Ransom to put the Aces up 2-1. Overall, Cain looked sharp on the mound, pitching around two errors behind him and keeping the River Cats in the game. He departed with Sacramento trailing and a runner on first with two outs in the seventh but the sold out crowd showed their support for the three-time World Champ with a standing ovation. Cain responded with an acknowledging wave to the crowd. Opposite of Cain, Reno’s Chacin (1-0, 1.29) was also dealing, allowing just one run over seven innings. He gave up 5 hits, walked 1, and tallied a season-high 9 strikeouts en route to his second win of the season. Chacin made his Aces debut tonight, having just signed with the Arizona Diamondbacks organization yesterday. Ehire Adrianza had a big night for the River Cats, both at the plate and on the field. With his third-inning single, the hot-hitting shortstop extended his current hit streak to seven games, two shy of his season high. He also doubled, and was 2-for-4 on the night, raising his batting average to .320 for the season. On the defensive side of the ball, Adrianza showed off his smooth fielding, making a diving play in the fourth inning and an running, over-the-shoulder catch in shallow center field in the seventh. It’ll be a Father’s Day matinee finale tomorrow afternoon as the River Cats look to avoid the sweep behind right-hander Jake Peavy (0-2, 5.70). Peavy made the best start of his rehab assignment his last time out, throwing 7 innings (95 pitches) and allowing 2 runs on 5 hits while striking out 5. The Aces will counter with their right-hander Gabriel Arias (5-2, 2.94). 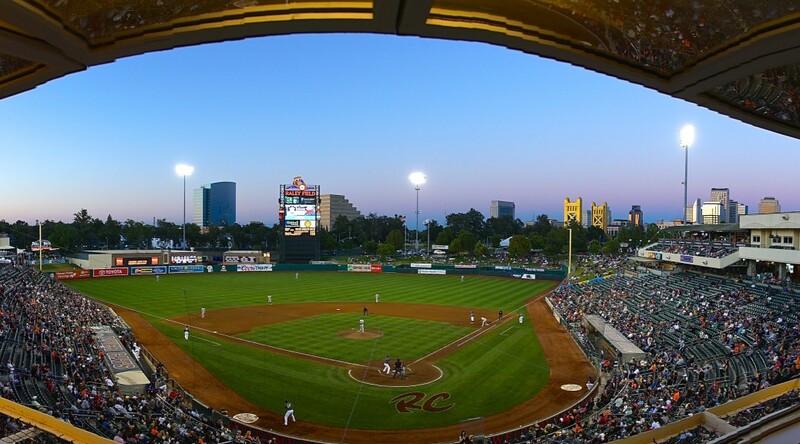 First pitch is set for 1:05 p.m.
WEST SACRAMENTO, Calif. – A four-run first inning wasn’t enough for the Sacramento River Cats as the Reno Aces rallied to a 6-4 win in front of 9,210 Thursday night at Raley Field. Despite an impressive start from Nik Turley – who struck out a season-high six – Sacramento watched their lead disappear late as they dropped the series opener 6-4 to the Aces. Turley looked dominant on the mound for Sacramento, shutting out the Aces through six innings while allowing just two hits and a walk. Pitching in the seventh inning for the first time this season, Turley gave up a two-run home run to Aces’ third baseman Jamie Romak before being replaced by Cody Hall. For the most part, Turley kept the Aces off the bases and off the board, allowing just the 2 runs on 4 hits and 1 walk while striking out 6 through 6.1 innings. Turley’s 6 strikeouts were his most in a start this season, passing his previous high of 4 (6/2 at Oklahoma City). He lowered his ERA from 10.47 to 8.34 with the outing. The River Cats jumped out early, scoring four times in the bottom of the first inning against Reno’s starter Caleb Clay. The big hit of the inning came from Hector Sanchez, who lined a two-out double to left field scoring Ehire Adrianza and Adam Duvall. Ryan Lollis followed with an RBI-double and Carlos Triunfel added an RBI-single before the inning was over. Overall, Sanchez was 1-for-4 and tallied his second multi-RBI game of the year. Triunfel was 3-for-4 on the night, raising his season average to .260. Reno rallied past the River Cats in the eighth inning, scoring four times on three this, two walks, and an error to take a 6-4 lead. The Aces sent nine men to the plate in the inning against Sacramento’s relievers Braulio Lara and Cody Hall. Both Cody Ransom (1-for-3) and Romak (2-for-4) drove in two for the Aces on the night. Lara took the loss for Sacramento, falling to 0-5 on the season. Matt Reynolds (2-4) picked up the save for Reno and Kaleb Fleck recorded his second save. Sacramento will look to even this four-game set tomorrow night behind lefty Ty Blach (5-6, 3.63). Blach has been very good at home, posting a 3-3 record and a 2.89 ERA. Opposing him will be another lefty, Reno’s Justin Marks (3-6, 6.08). 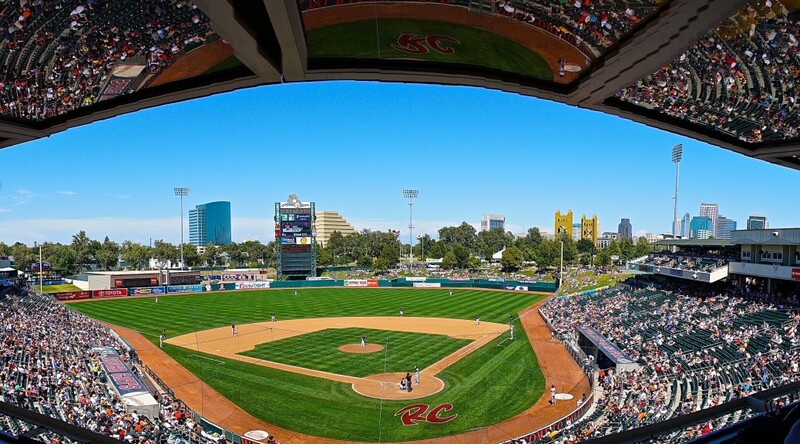 First pitch is set for 7:05 p.m.
WEST SACRAMENTO, Calif. – 9,497 gathered at Raley Field Monday night to watch three-time World Champion and three-time All-Star Matt Cain make his Sacramento River Cats debut against the division rival Fresno Grizzlies. Cain was excellent in the early going, striking out the side in the first and second innings, but the Grizzlies powerful offense eventually came through and Fresno took the series opener 6-3. Cain came into tonight, his second rehab start and his first with Sacramento, on a 75-pitch limit. That number reached 74 (47 for strikes) as he tossed 3.1 innings, giving up 4 runs (3 earned) on 6 hits. He struck out 7, six of which came in the first two innings, and walked 2. His fastball was hitting 91-92 mph consistently, and peaked at 93. Through his first two rehab starts, Cain has thrown 7 innings and struck out 9 compared to 2 walks and is 0-1 with an 8.10 ERA. Despite leaving with one out in the fourth and down by three, the crowd on hand showed Cain their support with a standing ovation. Cain walked off the field with an acknowledging wave to the loyal Sacramento fans on hand. Cain was followed by Clayton Blackburn and Jean Machi. Together, the trio combined to strikeout 16 Grizzlies. On the opposite side, Fresno starter Dan Straily was dealing, limiting the River Cats to just 2 hits over 7 shutout innings. He struck out 7 and walked 2 while throwing 96 pitches (64 strikes) on his way to the win. He moved to 5-5 with the win, and lowered his ERA to 4.25. Kevin Chapman picked up the save, his sixth. With Fresno leading 6-0 in the eighth, the River Cats scored their only runs of the night. Ehire Adrianza knocked in two with a bases-loaded single to left, scoring Carlos Triunfel and Ryan Lollis. Kevin Frandsen would also score on the play thanks to a Fresno throwing error. The Grizzlies were led by their right fielder L.J. Hoes, who was 3-for-5 with a run and an RBI. Third baseman Matt Duffy contributed with his sixth home run of the season. Game two of this quick three-game series will take place tomorrow night. The River Cats will send Jake Peavy (0-1, 8.10) to the mound for his fourth River Cats start. For Fresno, it’ll be the undefeated right hander Asher Wojciechowski (4-0, 4.50). First pitch is set for 7:05 p.m. (PT). 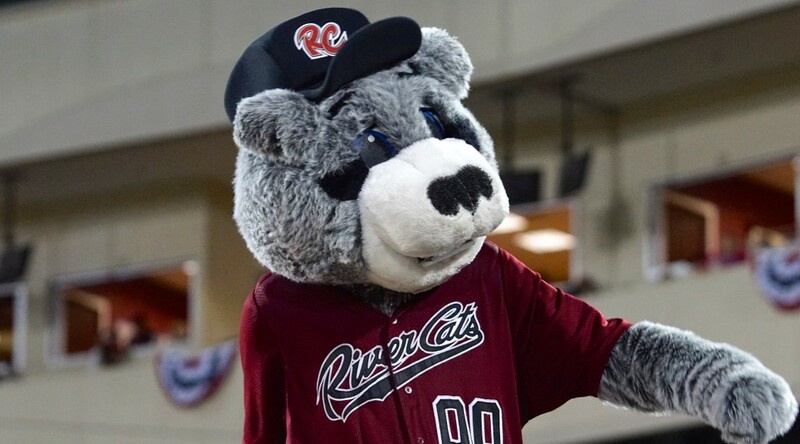 COLORADO SPRINGS, Colo. – The Sacramento River Cats won their second straight as they took game three of their four game series with the Colorado Springs Sky Sox 10-5. After snapping a franchise long losing streak on Saturday, Sacramento was backed on Sunday by a pair of home runs by Jarrett Parker and a strong pitching performance from Robert Coello. Sacramento wasted little time getting on the board Sunday. After the first four batters of the game had been retired, Parker stepped up and crushed his 10th home run of the year over the right field fence, putting his club up 1-0. Two batters later, the River Cats added to their lead on a Trevor Brown single, driving in Juan Perez. Colorado Springs struck for their first run of the ballgame in the bottom of the second on a two-out single by Pete Orr. The River Cats countered in the third with an Adam Duvall RBI single, scoring Ehire Adrianza, who reached on a walk and advanced first-to-third on a wild pitch. Sacramento added another run in the fourth on a bases-loaded single by Casey McGehee. The Sky Sox got back on the board with a run in the bottom of the fourth, as Nevin Ashley scored on a throwing error by the catcher Trevor Brown. 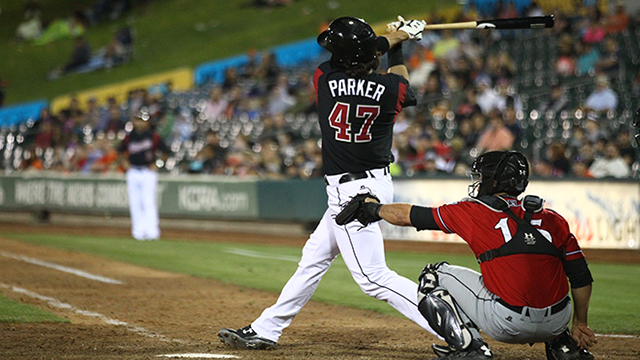 However, the River Cats didn’t take long to strike back, as in the fifth inning Parker hit his second homer of the day to put Sacramento up 5-2. Parker finished the day 2-for-4 with 2 home runs, a walk, and 2 RBI. The 2-hit day moves Parker one hit shy of 500 for his minor league career. Colorado Springs put up a threat in the sixth, scoring two early runs and loading the bases with nobody out. Coello, however, managed to escape the inning with a one-run lead still intact. In the seventh, McGehee led off the inning with his first home run as a River Cat, providing padding the lead for Coello. McGehee finished the day 2-for-4 with a walk and 2 RBI. The River Cats plated four more insurance runs in the final two innings to secure the victory. Coello (6-3, 3.50) pitched well and earned the win in his PCL leading eleventh start of the year, pitching 7 innings while allowing 4 runs (3 earned) on 7 hits. He walked 2 and struck out 4. His counterpart, right-hander Drew Gagnon (1-7, 7.91), lasted 5 innings while allowing 5 runs (all earned) on 9 hits, striking out 2. The River Cats will go for the series victory on Monday. Sacramento’s starting pitcher has yet to be announced, but the Sky Sox will be sending right-hander Tyler Cravy (5-4, 4.04) to the mound. First pitch is scheduled for 11:35 a.m. (PT) and can be heard on rivercats.com. 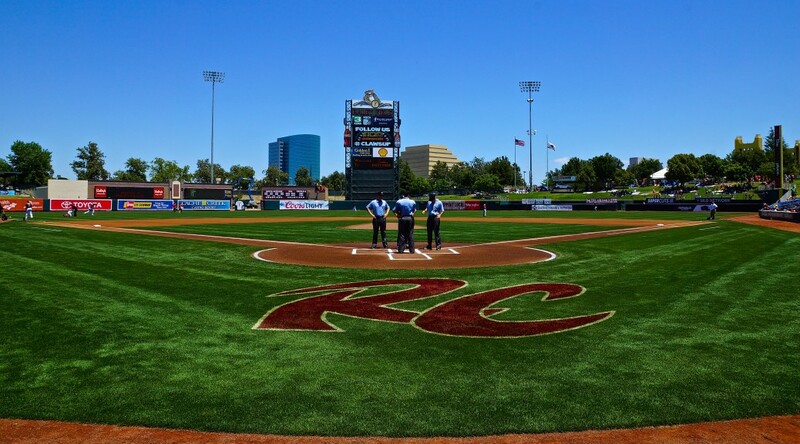 Following the game, the River Cats will head to Oklahoma City to begin four game set with the Oklahoma City Dodgers.